The attached Photograph dating back to the 1950 show HAV 384 in Barnsley Bus station preparing to depart for Pontefract on the Ideal service route run jointly with H Wray & Son. This vehicle was new to Simpsons of Rosehearty before being acquired by Taylors. The driver is Dennis Taylor, his older brother Len also drove. This was in fact one of the buses used on my school run on a morning and tea time to the High School and Kings School in Pontefract. This involved 5 buses on the morning and afternoon run. The morning being the worst as I lived in a village which was the last port of call into Pontefract and 1 of the 5 was the service bus you would put your hand out and eventually one would stop. Although the service ran in all weathers its time keeping was not what you would call excellent. It left the top of my village at 10 to the hour and arrived any time between 20 to and 10 past. You could always guarantee a place on the last bus from Pontefract on a Saturday night. They never left any one, a 35 seater was stopped by the police one night and 72 occupants alighted!!! Mention of packed last buses brings to mind the apocryphal story of the last Pennine bus from Skipton which had a passenger sat alongside the engine on the near side mudguard! How very interesting! Thank you for posting this. It raises a little query which, perhaps, ought to be in the "Q&A" section. I have a bought slide of JWF 885, an Albion CX13, which was listed in my source’s catalogue as belonging to Ideal, Wray & Son, of Harrogate. We’re not talking of the same firm here, I suppose. Are we? Pete the Wrays of Harrogate I think were based at Starbeck, they were mainly a coach operation if I remember right. They sold out to Eddie Brown. 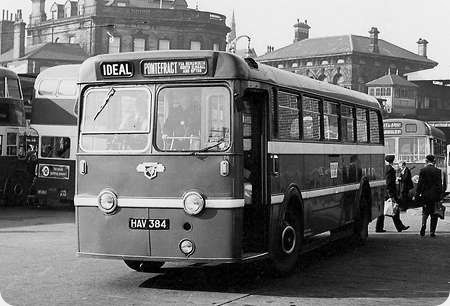 H. Wray of the Ideal service were based in Lord Street Hoyle Mill Barnsley, where I think it was the 4pm out of Barnsley used to stop to fill up complete with passengers before continuing on its route. Thank you, Brian. I thought my assorted sources might be wrong – again. JWF 885 belonged to France (Ideal Motor Services), Market Weighton, East Yorkshire. JWF 885 was new to Baldry of Sancton in 7/51 it passed to France’s Motors T/A Ideal of Market Weighton in 1/54, both in the East Riding of Yorkshire. JWF was a Albion FT39N with Barnaby or Scottish Aviation body!! I’m a little puzzled here: I thought that Leyland gave up building single deck bodies, in favour of just double deck ones, as a peacetime decision, at least until it had to with the Leyland National/Lynx. Am I wrong, or was this a one-off demonstrator? There are 5 pictures of post war Leyland bodied SDs on SCT ’61 photo index Body Builder-Leyland picture number 249 onwards plus more further down. I read an item on Simpsons and they received three of these Tigers HAV384/5/6 There is a photo on flicker of HAV386 I also understand that the 3 were mentioned in the Leyland Bus book, however I am unable to check this as I am in the process of sorting my book storage and I can not put my had on the book in question. Interesting to read Mike Davies’ comment about JWF 885 having a Barnaby or Scottish Aviation body. The PSV Circle records it as Barnaby but I have a recollection of visiting France at Market Weighton some 40 years ago and seeing it with a Scottish Aviation body sticker. For all that time I’ve thought I must have been mistaken but here is some other evidence that points that way. Brian, it was W. Pyne & Sons who were based in Starbeck (on Camwal Road) and their white and purple coaches were a familiar sight around the area for many years. Wray’s operated from their garage at Dacre Banks, which is between Harrogate and Pateley Bridge. Their coaches usually had ‘Wray’s of Summerbridge" on the rear however – Summerbridge being a larger village, literally just over the River Nidd from Dacre Banks. (Presumably Wray’s felt people would know where Summerbridge was, but might not with Dacre Banks!). Wray’s livery was mid-grey, greeny-grey and red, and the firm’s coaches could often be seen in the summer months with windscreen stickers proclaiming "On Hire To West Yorkshire". Indeed, some of their distinctive coaches could be often be seen parked on the forecourt of WY’s Grove Park depot in Harrogate. At one time Wray’s fleet included a Yeates-bodied AEC Reliance and Yeates-bodied Bedford SB, whose flamboyant styling provided an interesting contrast as they rubbed shoulders with the classic lines of WY’s ECW-bodied LS, MW and RE coaches. Thanks Brendan for the correction, I remember now. I should have twigged as I travelled past their garage at Dacre Banks often. I do remember seeing the "On hire to West Yorkshire" as you say in the busy period. Chris, your comments re Leyland single deck bodies prompted me to plough through my old issues of Classic Bus as something rang a bell (issue 5, June-July 1993). You are right that Leyland did focus on only double deck bodies immediately post war, due to the huge demand for them at the time. This lead to the successful Farington body in 1950 which was built until 1954. The single deck bodies came about following the integral Olympic project in 1949, in conjunction with MCW. 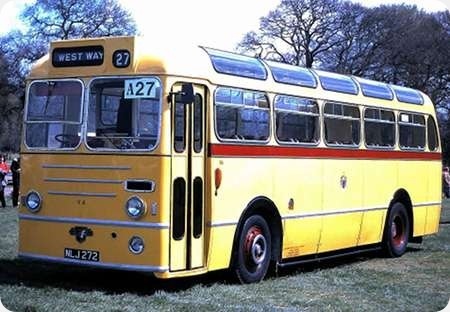 After that they produced two standardised single deck bodies for the Royal Tiger, the familiar all metal, centre entrance coach body from 1950, and the rather angular bus version from 1951. Nothing followed for the Tiger Cub so, as you have stated, next in line was the National, nearly two decades later. The photo of HAV 384 could only have been taken in the mid-1960s, since Simpsons themselves were running it well into the decade. There were only two vehicles in the batch, HAV 384 and HAV 385 – the latter operated for Garner, Bridge of Weir after service with Simpsons. 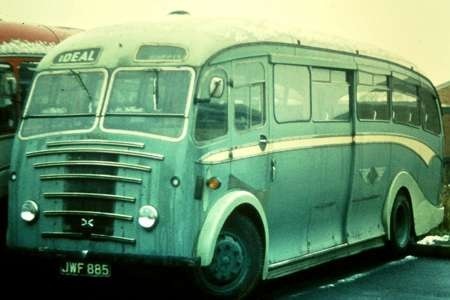 ‘HAV 386’ was an invention of the Ribble Vehicle Preservation Group, the vehicle which has appeared in photographs showing that registration was really ERN 709, originally Ribble 386, later with UTA/Ulsterbus. Talking of Wrays of Dacre Banks, didn’t they too finish up somewhere in the Knaresborough area? Whether or not it was Starbeck I don’t know, I don’t know the area all that well. Well, this does get confusing. I’m glad I asked. I’m attaching a view of my bought slide, which doesn’t look to have a very green livery to me, unless it’s a combination of scanning a bought slide which may or may not have rendered the original properly, and my less than pristine eyesight. As noted in my original comment, it was listed as a CX13. Chris, Leyland built large numbers of bodies in both bus and coach form on the Royal Tiger, many of them for Ribble. They finally gave up body building in about 1953. My understanding has always been that they were too busy on chassis to afford to have anyone on building bodies. Look under Pennine in the operators section in the column on the left of the page for a view of the demonstrator Royal Tiger coach. I believe Baxters of Airdrie had a former demonstrator in bus form. Thank you, David. Now, any other words of advice from anyone about JWF? 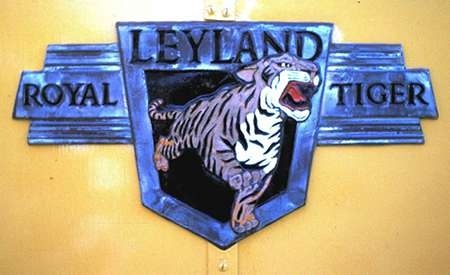 Thanks, Mike M & Pete D for reminding me of Leyland’s coach version of the Royal Tigers’ body, which I DO recall now, working for Southdown. I never remember seeing the bus version, perhaps because they tended to be and stay ‘oop North’! There’s a photo of JWF at https://www.flickr.com/photos/ which says it’s an FT39N with Scottish Aviation 31-seat body. In view of the size I would definitely rule out CX13, and although I have never before seen a Scottish Aviation body with a curved window line (the windows don’t look very happy, so perhaps it’s the only one they built! ), the trimmings do look exactly like theirs. The two buses HAV 384 and 385 left the Simpson fleet in March 1961 and October 1960. HAV 384 going directly to Taylor of Cudworth part of the Ideal consortium. They sold the vehicle to Mellers of Goxhill in October 1967. It operated for them until October 1968. HAV 385 went directly to Garner of Bridge of Weir in October 1960 and then to Tiger Coaches of Salsburgh in March 1967. From my own notes and checked with the PSV Circle publication SAD1, pre war operators in Aberdeenshire and Kincardineshire. It seems I was a few years out in my estimation of when Simpson’s disposed of HAV384 – anyway, at least it wasn’t in the 1950s. This photo taken in the mid sixties in Pevensey Road Eastbourne shows one of my all time favourites, one of batch of thirty No’s 1510-1539 Reg No’s MCD 510-539 delivered in 1953 it is a Leyland Royal Tiger PSU1/13 with an East Lancs body delivered as DP40C and converted to B39F for OMO use in 1961 then sold in 1968. These followed a batch of ten No’s 1500-1509 Reg No’s LUF 500-509 delivered in 1952 these differed in being delivered as B40R also converted later for OMO work. My best memories of these handsome buses were in the mid fifties on the 126 route from Eastbourne to Seaford by the inland route via Alfriston and a steep climb over the South Down known as High and Over, the pleasure was much greater if I was able to bag the front N/S seat opposite the driver for which I always arrived early, the usual two cars (to use correct Southdown term) were 1528 and 1531. I little thought that about 14 years later I would be driving Leopards on the virtually same route but always wished it was one of those Royal Tigers. Very nice, Dave, but wasn’t B39C a bit difficult for OMO/OPO working? Does anyone know what caused Southdown to buy East Lancs bodywork, a very accurate attractive bus but at the time East Lancs customer base was mainly in the north. Did Southdown really use these as B39C for OMO work? There is a typo in Dave’s text. Should read’ and converted to B39F I also remember travelling on these as a child, both before and after conversion, and like Dave used to go for the front seat when they were central entrance. They were replaced in 1968 with a batch of Marshall bodied manual gearbox RE’s, which I seem to remember were not to their drivers liking! Spot the not so deliberate mistake 1515 was of course converted to B39F for OMO/OPO work part of the conversion entailed the previously recessed N/S windscreen being made upright to accommodate the new doors when open, my apologies for my poor proof reading. 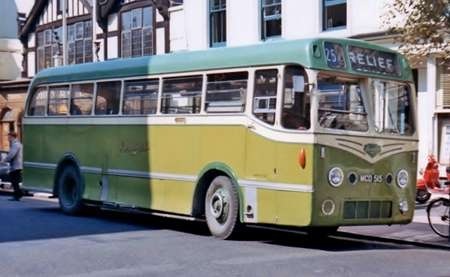 Chris Hough asks about Southdown’s use of East Lancs products – I think the first use was in the war-time rebodying of two Leyland TD1s, and eight Leyland TD2’s to utility specification, a job which East Lancs was authorised (with Willowbrook) to do, rather than body new chassis. Southdown must have been satisfied, because East Lancs was included in the re-bodying programme of Leyland TD3s, TD4s and TD5s just after WWII. This exercise included several body-builders, including Park Royal, NCME, Saunders and Beadle. 59 bodies were completed by East Lancs between 1946 and 1950. Then the 40 Royal Tigers followed, and the final 24 PD2/12’s (789-812). However Southdown multi-sourced by also ordering from Park Royal, Beadle and NCME for double-deckers in the 1950s, finally settling on NCME for the 285 Queen Mary PD3s.